If you were in Dallas for the NCAA® Men’s Final Four® last weekend, you may have seen one of our premium suites in action at AT&T Stadium. 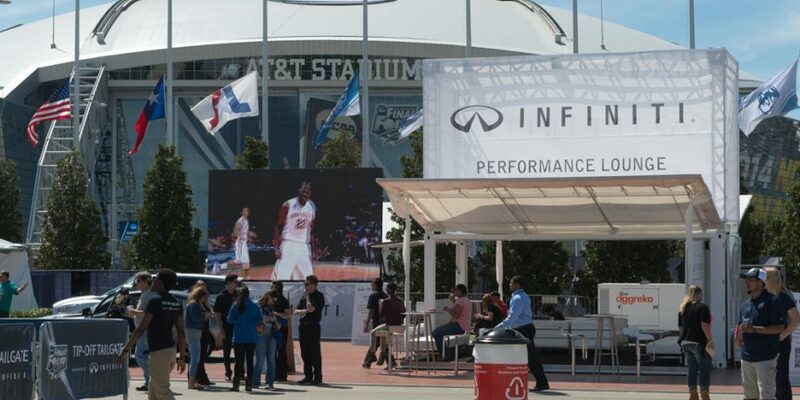 We’re thankful to have worked with Turner Live Events, part of Turner Broadcasting, to build the Infiniti Performance Lounge at the Tip-Off Tailgate presented by Infiniti. The event featured a myriad of NCAA Corporate Champion and Partner activations throughout the weekend, which included sponsored concerts, pep rallies, coach appearances, and a variety of interactive basketball activities. Set up directly outside of AT&T Stadium the Tip-Off Tailgate, presented by Infiniti was the first stop for fans on their way to the big games. We worked together with Turner Live Events to better enable Infiniti to create a high-end, luxury hospitality space that reflected its brand. We repurposed our 20-foot suite and created a towering 10-foot banner on top of the container that allowed attendees to spot the Performance Lounge from anywhere in the Tailgate. Infiniti invited visitors to relax, experience its luxury vehicles, and enter into the Infiniti Premium Pass Ticket Upgrade giveaway. Inside of the suite was furniture, an LCD television display, and a full sound system. This particular build had the added customization of creating engineer-designed trussing to mount the large branding space on top of the container. Once set up, the Performance Lounge towered more than 20 feet into the air. This is our second activation with Turner Live Events, and we thank them for the opportunity. We had a great time in Dallas, and can’t wait for our next project together.